I was born in one of the great National Parks in the world: Banff and I live just outside of Calgary, AB in the Great White North. I love it here. I saw you call yourself half Canuck/half Brit. Do indentify with one of those cultures more than the other? Well probably a tad more Canadian seeing as I was born here and live here now, but certainly it’s pretty close. Friends often ask me who I support in events where they meet up. Thankfully it works out pretty well. Hockey – Canada, Footy/Cricket etc. – England. Boy would I like to see the bloodbath if they ever met up in any of those sports! But I lived a long time in the UK, went to university there etc. So I love the culture the land, history and the comedies lol. How did you get into t-shirt design? Well I studied in illustration/design years ago and what with life getting in the way never really had much creative outlets with my career. Though that’s changed a bit the last few years. Anyway, someone showed me Redbubble where they had bought an iPhone case and I checked it out. 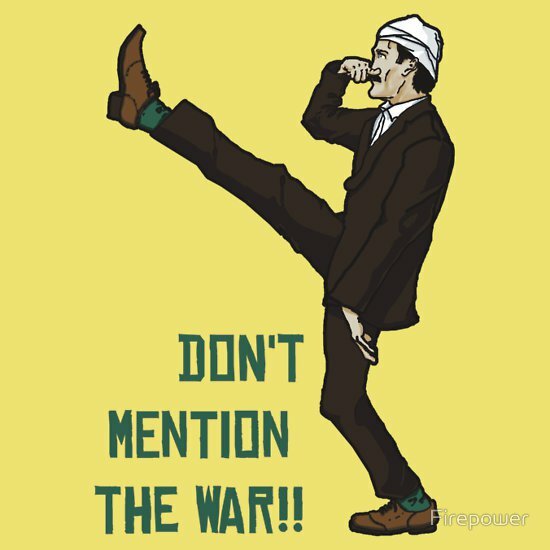 1 of my early pieces was “Don’t Mention the War! 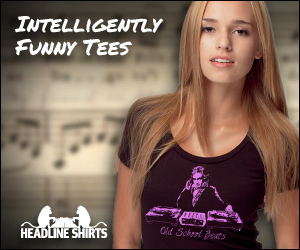 !” a Fawlty Towers t-shirt that did pretty well and continues to, to this day. From that glimmer of success I just carried on and can’t say it’s been blockbuster but not too shabby either. Are you a full time designer? Oh if you’re speaking content-wise, you’d have to say that I predominantly do “geek” stuff. 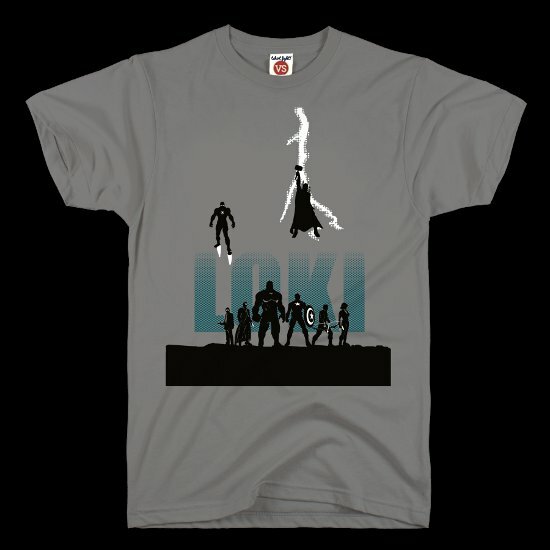 Star Wars, Trek, Indy, Game of Thrones, Walking Dead, Marvel characters….can’t get much more geeky than that. Having said that I try and do pieces with a bit of wit behind them, not just fan-boy, fan-art takes on these franchises. Zombies, Star Wars, Sci-Fi, all that stuff in the previous question and for the same reason. I’m a geek. I do a few comedy shirts too. As mentioned my Fawlty Tower one, I have Little Britain, Monty Python and Extras. But the geek stuff is probably my fave. Apart from being a popular theme, geekery is also diverse in the amount of things you can cover, always changing and lots of interesting subject matter. From Sci-fi to gaming, to tv shows to comics etc. Oh don’t know about that one. Perhaps my age. I think I’m probably older than a lot would assume. Lots of t-shirt designers around seem to be younger than me. Don’t know what that says though. 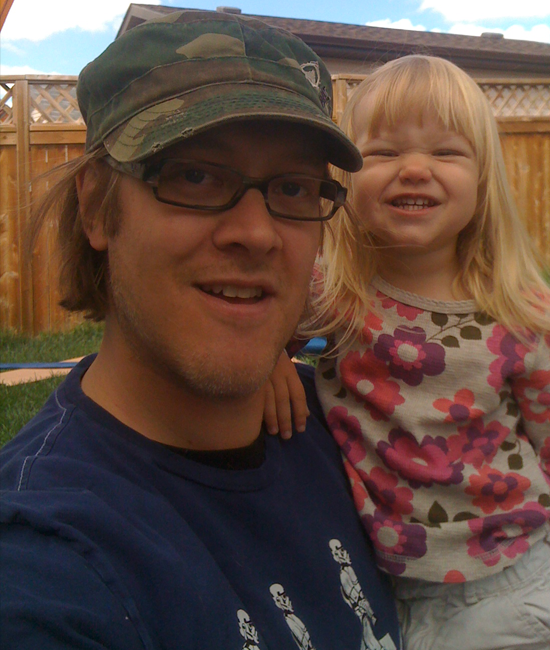 I’m almost 40….almost. In doing a little research on you, it looks like you’re a family man. Wife and kids? Yeah a wife of about 13 years and a 2 and-change year-old daughter. Both of which keep me more than on my toes! You mention that you’re a Star Wars fanatic. How did that happen and how does it manifest itself in your day-to-day? I am indeed. how did that happen? Well I was born smack bang in the middle of it at the greatest time. Almost 4 when A New Hope came out so the perfect demographic. Saw all the movies, bought all the toys, just grew up with it. How does it manifest itself? More often than you’d think. You know I’m a fanatic when my wife randomly comes home with Star Wars cookie cutters (for example) she found because she knew I’d like them. And then there’s the script that runs through my head when appropriate (though at least I keep that in my head now, for the most part). So let’s say something momentous happens well of course I think “This will be a day long remembered” stuff like that. But I don’t think I’m unusual in that way, at least compared to many geeks. There are a number of us Star Wars fans out there you know. Although I almost wish it wasn’t such a point of attraction to me, what with Lucas Arts and their constant cracking down on designs…shhhh don’t let them hear me. Explain to me the power of mashups? Well its funny I think people take mash-ups too seriously and think there are rules. I think it can be as simple as two franchises coming together where normally they wouldn’t. I recently explored the idea of Vader with Iron Man’s arc reactor instead of his 70’s chest-plate and that was the only element crossing over. Then I did it viceversa . When I posted it a couple of times some people came down on it and said “hey you gotta mix them up more. Make Vader gold and Orange” blah blah. Who says! 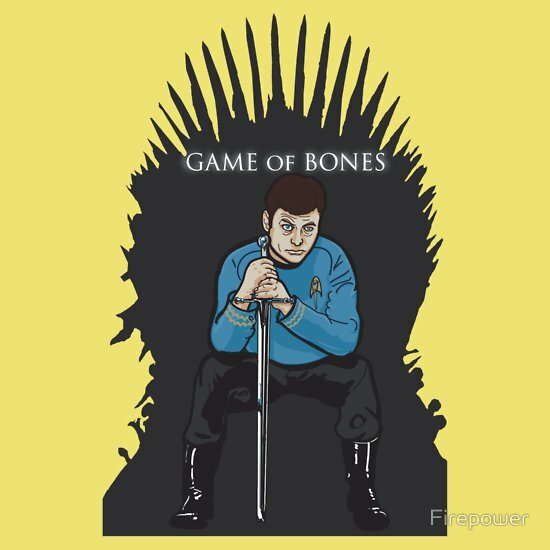 Or my Game of Thrones series where I put in Indy (Game of Jones) or Leonard McCoy (Game of Bones) they really are mash-ups using the name alone. I don’t have to put McCoy in armor etc. But that’s the great thing about mash-ups, they give you a much bigger palette of genre and franchise to play with and usually end up being unique/clever. Oh everywhere. Fellow designers, trawling the net, movies and tv. I even get my own eureka moments sometimes. Used to be heavily photoshop, but now mostly Illustrator, maybe some sketching before that or straight into the program. I can’t wait to get the new Microsoft Surface pro tablet (or similar) so i can load on illustrator and have a tablet i can draw directly on the screen, on the go. Best movie and/or TV show you saw recently? Very much back into the return season of The Walking Dead I’d have to say. Well I’ve been with my partner for 13ish years, we have a child and aren’t married, so living in sin literally! What was the first design you ever got printed? I haven’t had a t-shirt printed from a site like Qwertee or Ript etc. Although in fairness I’ve only just started trying those recently. 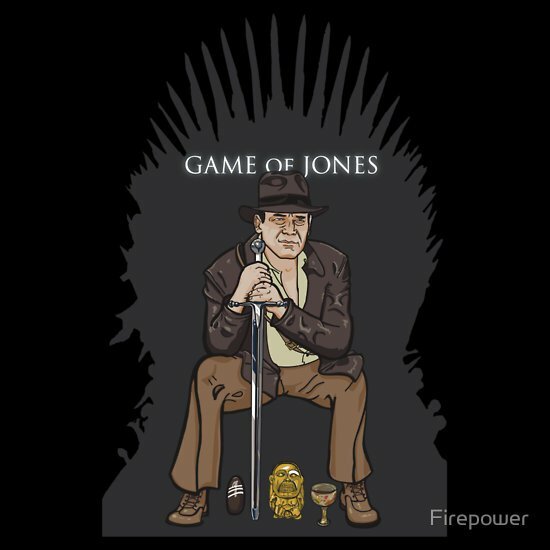 My first T-shirt I made that was sold on Redbubble is Game of Clones. It’s still my third best selling shirt and it isn’t even on RB anymore thanks to the Lucas police. And this brings us nicely to the next question. Favorite t-shirt that you designed? 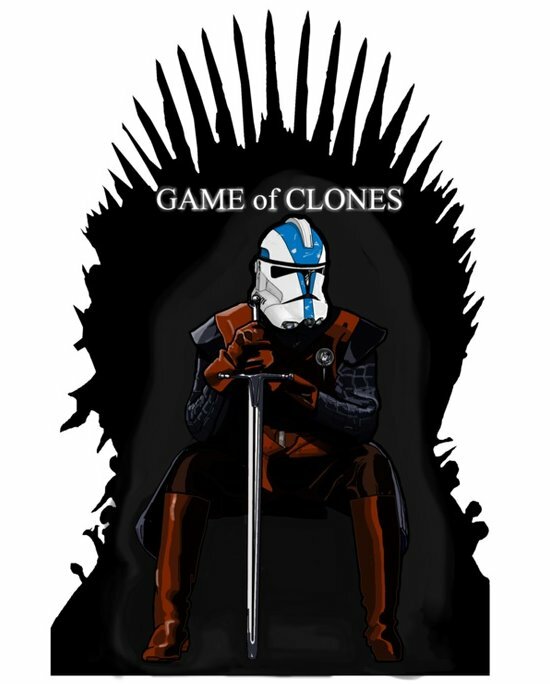 Game of Clones is probably my favorite. Not just because it sells well. I just think it works really well and came together nicely, both as an idea and in execution, if I do say so myself. The previously talked about. “Don’t Mention the War!” closely followed by two from my Game of Thrones parody pieces: Iron Throne (Iron Man based) and Game of Clones. Latest design available for sale? 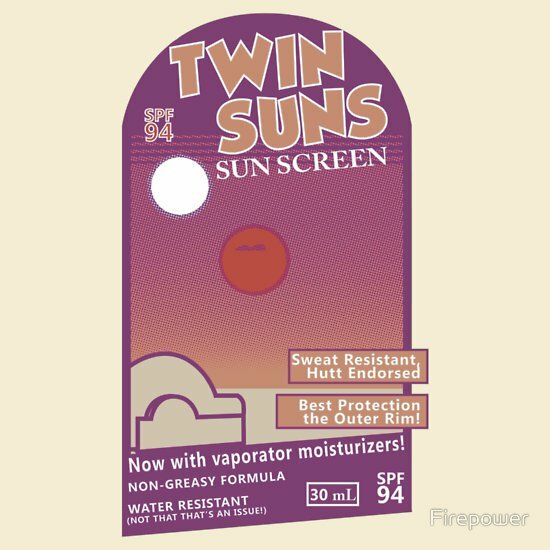 “Twin Suns – Sun Screen” – It’s a t-shirt of a sun screen lotion from Tattooine. I just came up with it recently and developed it pretty fast. Just a little fun. The tag line is “The Best Protection in the Outer Rim!”. 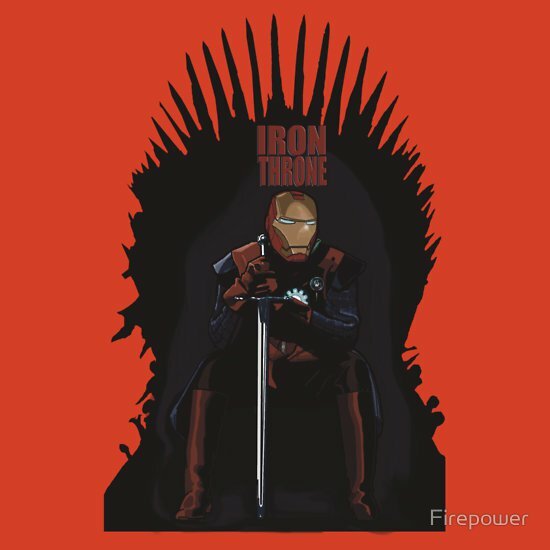 I have a couple on Qwertee: Winter is Coming Here and Bill Dead that’s done alright with votes and a recent new submission to Ript. If I don’t hear back from those I’ll post them on Redbubble etc. Also my T-shirtfight.com tee will go up on RB. If Romney is elected maybe. lol I should stay out of that to be serious. No was it the Mayan prophecy that predicts this? They starved or were affected by drought and died off. I figure if you can’t even see your own demise coming you don’t have much credibility in predicting others. You were featured on Tshirtfight.com, which pits one design versus another. Your design won and now your onto the second round. That’s fun, right? Yeah it’s been a totally fun ride on there. I hope to submit some designs for other fights. The first week tied and so it stayed on another week, and then it won the second week. Which I was surprised about because several people; although liking both, preferred the other one. So I was genuinely pleased to be triumphant. Also the guy running the site; Joe, is really nice. Yeah, a few of us designers (be it t-shirt design, sketch cards etc.) who became friendly on twitter, got together and formed an artist collective. We bounce ideas off one another, critique work and we also sometimes do themes where we pick a brief and all do our own take on that. It’s been a bit slow to set up because we all have lives and work etc. But it’s a cool group of supportive, like minded….geeks. We’re on Facebook there too. We’re called the exPENdables, just as a bit of fun. We like to think we put the PEN in exPENdables lol.